Mechanical engineers and insulation contractors are critical components to every successful build, particularly when it comes to designing and installing insulation systems. Engineers design the insulation systems that help ensure that mechanical systems within buildings operate efficiently, while contractors bring those designs to life by installing the insulation to the engineer’s specifications. While these 2 roles directly relate to each other, they typically operate independently of one another. Even though this is the standard process for insulation system design and installation, it can prove to cause some disconnects between what happens on paper and what happens when it comes time to do the installation. As everyone knows, what may appear seamless on paper doesn’t always happen as smoothly in real-world applications. Oftentimes contractors have to make creative installation adjustments to ensure that the insulation can be applied properly within the confines of the specifications, space, and design. To get a better perspective on the challenges installation contractors face in the field, we spoke with installation expert, Jeremie Overson, a professional contractor trainer in New Mexico who teaches contractors how to install and insulate mechanical and HVAC systems. Overson has multiple years of field experience working in and around structures under construction, and he has certainly seen his fair share of good and bad designs when it comes to insulating pipe systems. We asked him to share some of the common design oversights he’s seen that can cause major headaches for contractors during installation. By highlighting these items, engineers can be mindful of these potential real-world pitfalls when designing their systems. 1. Insufficient Room: The desire to save space and ensure efficiency can cause things to get a little tight in pipe systems. This creates an environment where the contractor has to improvise in order to figure out how to install insulation to code and specification in spaces that are simply too small for the insulation to fit easily. Overson indicated that he frequently sees pipes placed right next to conduits, walls, and other pipe hangers. These narrow spaces can cause the insulation to be crushed during installation, which damages both the insulation’s integrity and its efficiency. Additionally, it can be difficult to achieve a proper vapor barrier when space is highly restricted. When designers fail to account for the real-world application and installation of the pipes and the insulation, the ramifications can ultimately affect the whole system, not just the contractors who are installing the insulation. 2. Nominal Thickness: While this is a critical component to achieve maximum insulating value, designers occasionally do not account for the size of the outer diameter of the pipe in relation to the size of the inner diameter of the insulation. This is particularly relevant when using rigid insulations. When some pre-formed, rigid insulations have an inside diameter that is different than that of the pre-formed pipe covering, making the 2 fit together is not only challenging, but it can also potentially hurt the insulating value of the insulation. Overson explained that it can also be difficult to ensure that the final product has a clean, finished appearance when the contractors must make adjustments to the insulation in the field to ensure that it fits the pipe properly. 3. Twisting, Turning Runs: It’s no small secret that straight pipe runs are the most contractor-friendly when it comes to installing insulation. When a system is designed with unnecessary turns, it can not only increase the installation time, but it can also negatively impact the system’s long-term performance. Overson indicated that in his tenure as an installer, he has heard several contractors complain about certain materials shrinking over time. Insulation shrinkage is concerning in any system, but in a system with frequent turns and contusions, the effects can be exacerbated by numerous areas of shrinkage throughout the entire run. While both mechanical engineers and insulation contractors play a role in successfully completing a job, understanding the different demands of each position can ultimately streamline the process. 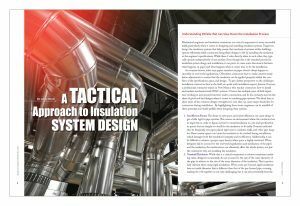 When engineers are able to approach a job with a better understanding of how their insulation systems are implemented, they are able to create systems that are not only efficient when complete, but are also efficient to install. As the end game is to cost effectively maximize performance, taking a tactical approach that explores the downstream impacts of design can be a major step toward saving time, material, and money.